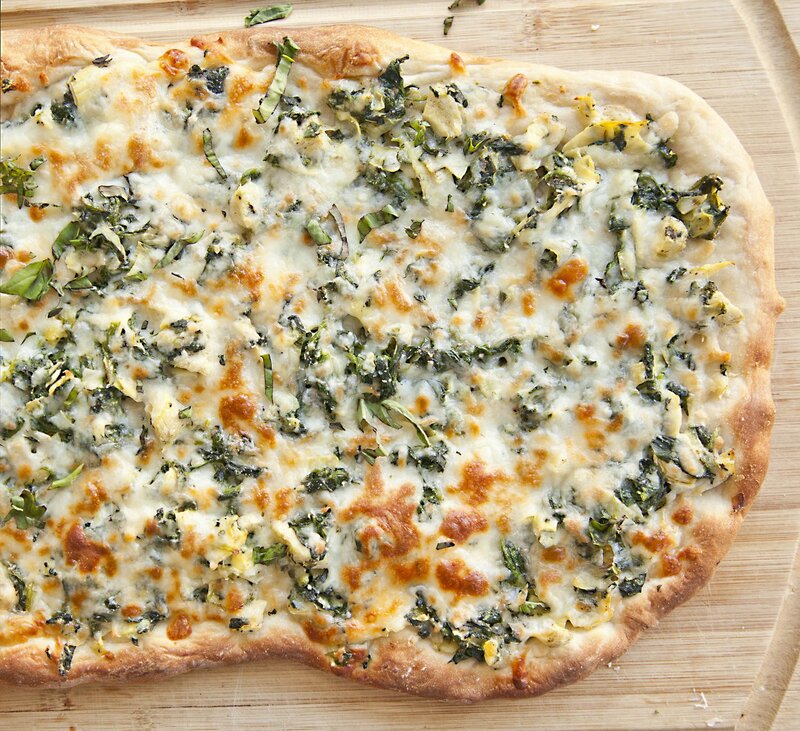 I am always looking for fun ways to top pizza, because let’s face it, you could put anything on pizza dough and it works. 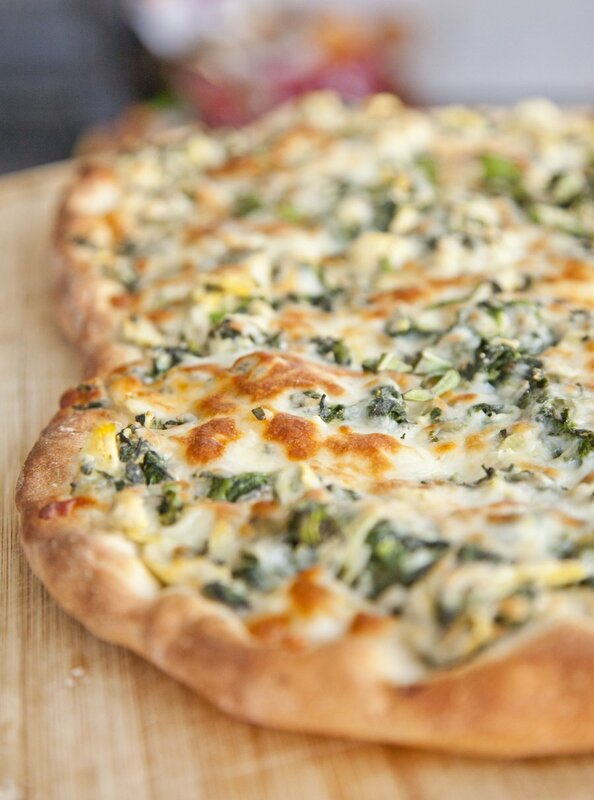 I love Spinach Artichoke Dip (for my recipe click here), so I decided to change up the recipe a little and make it as a pizza. This is so incredibly easy to make – I get store bought dough because the one thing I detest making as a chef, is dough. I am too impatient to wait for yeast to rise, I hate dealing with the huge stand mixer to make the dough, I hate cleaning up the inevitable flour that gets everywhere, etc etc. If you have a Wegman’s by you, their premade dough is AWESOME. You can also go to your local pizzeria and ask to buy dough there as well (a great trick I learned years ago). Last night I topped the pizza with fresh basil which I highly suggest doing, the fresh basil flavor really lends itself to the ingredients on the pizza. My hubby also chose to add a little Cholula hot sauce to the top, which with the basil was a winning combo. 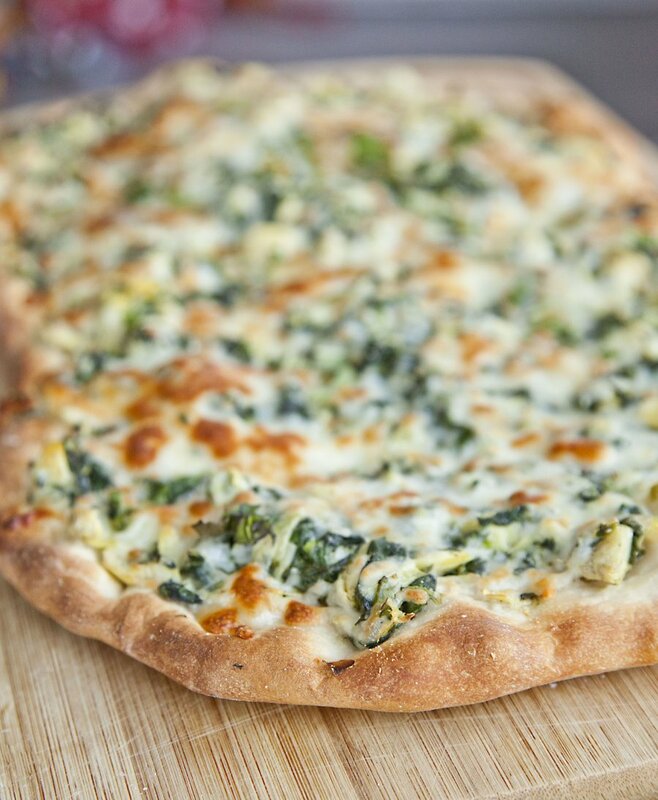 Your favorite dip made on a pizza! Preheat your oven to 375 degrees and spray to baking sheets with non-stick spray. Stretch out your pizza dough into two equal sized pizzas (one per baking sheet). Bake the dough for 10 minutes then remove from oven. In a large bowl combine your artichokes, spinach, mayo, Pecorino Romano, garlic cloves, 1 cup of the mozzarella, pepper, oregano and salt. Mix together thoroughly. Spread this mixture evenly amongst the two doughs. Top with the remaining 2 cups of mozzarella cheese. Bake for another 12 minutes, then without opening the oven, turn the oven to Hi Broil and bake another 3 minutes, or until the cheese is bubbly and slightly browned. 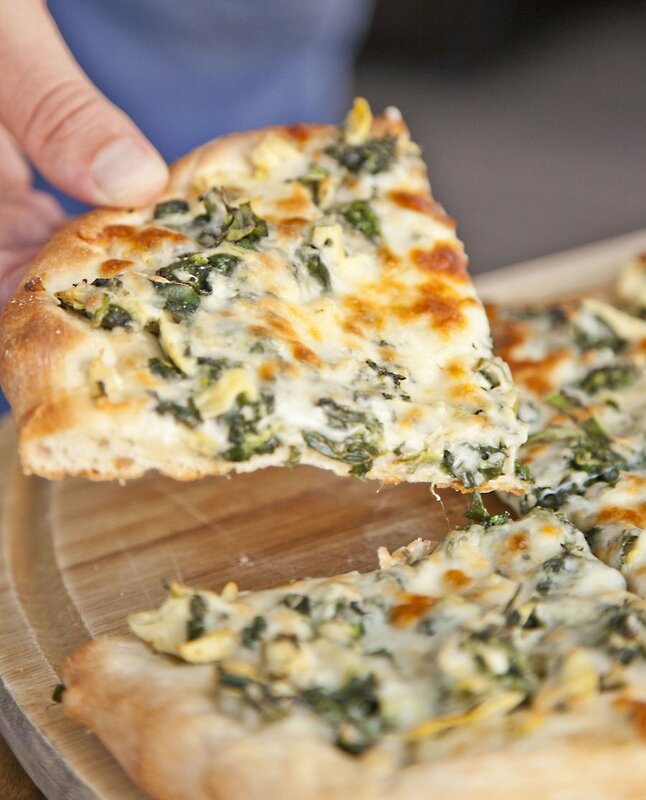 Serve hot topped with fresh basil on top. 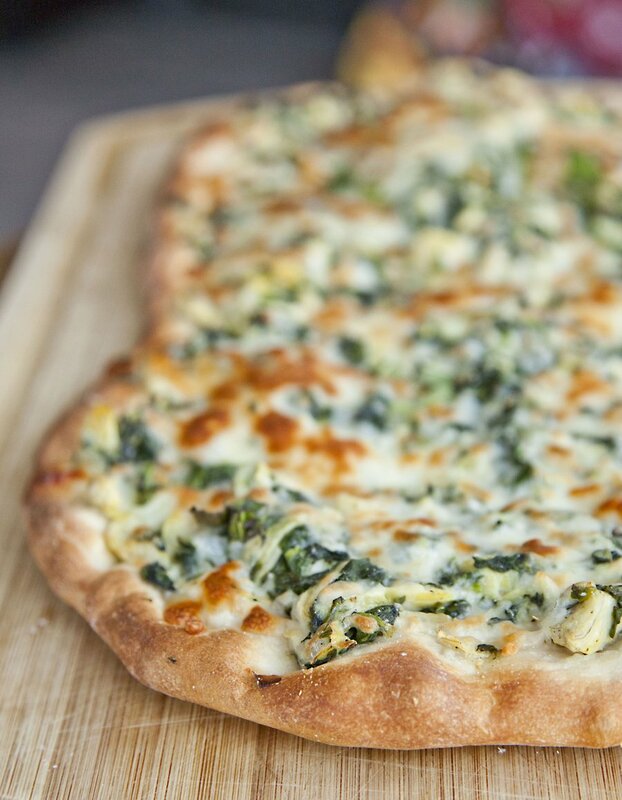 Your favorite dip is now on top of a pizza!